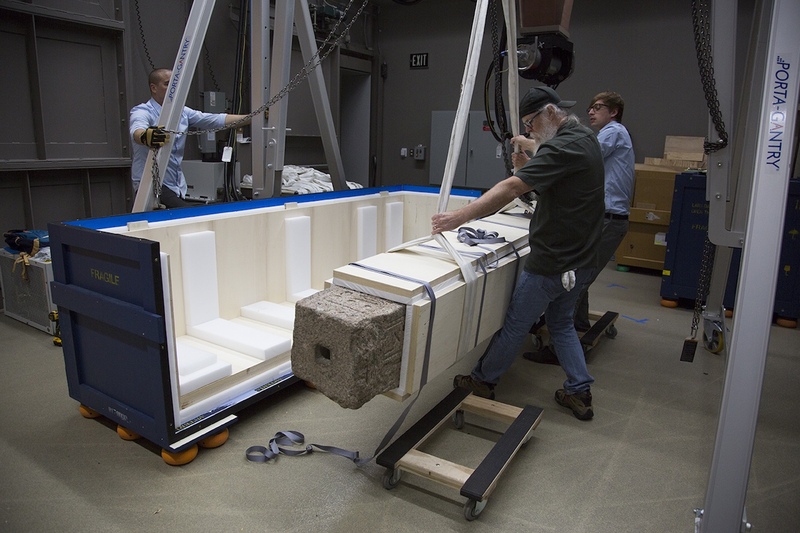 A look at the manpower and engineering needed to move obelisks in ancient Egypt, Rome, and today. 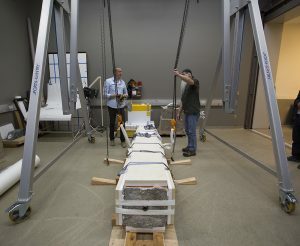 A few months ago, I introduced a granite obelisk from the Museo del Sannio in Benevento, Italy, which is now at the Getty for conservation treatment. 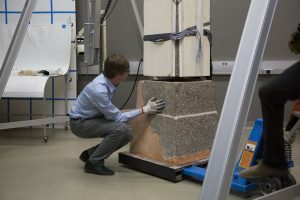 Our project is timely: since my last post, archaeologists have discovered a fragment of the largest-known obelisk from Egypt’s Old Kingdom, dating to about 2350 BC. 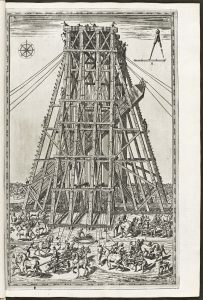 Likewise, the Getty Research Institute has recently digitized a collection of seventeenth-century engravings showing obelisks in Rome. 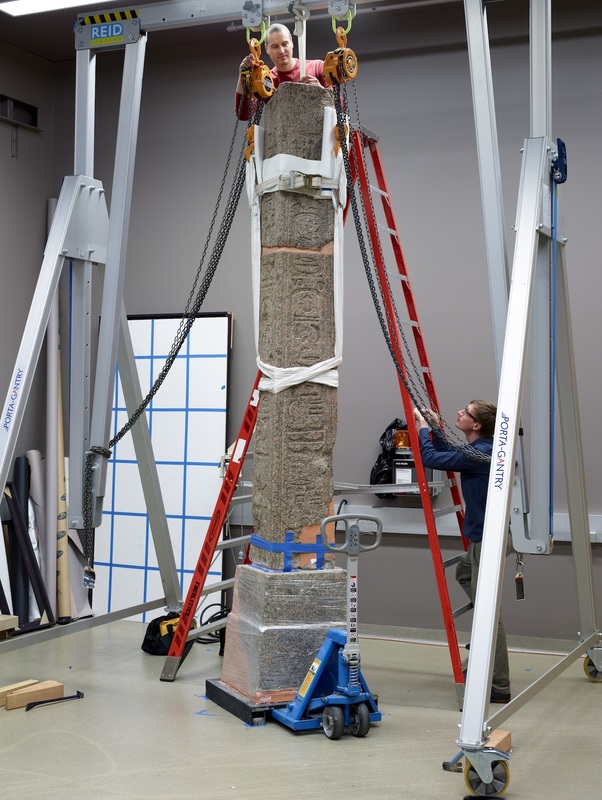 Obelisks clearly have continued to capture the popular imagination long since their heyday in ancient Egypt. Our desire to possess them, along with the power and monumentality they represent, has not waned. 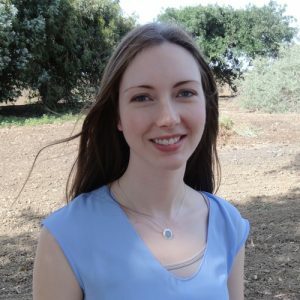 One of the many questions about ancient obelisks is a logistical one: how did the Egyptians, and then the Romans, manage to transport and erect such massive monuments without the aid of modern technology? 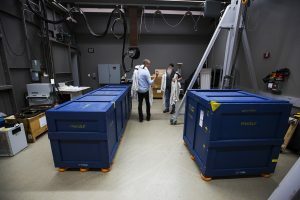 In this post I’ll discuss what we know about how obelisks have been moved over time, and give a behind-the-scenes look at how we brought the Museo del Sannio obelisk to Los Angeles. While the specifics of obelisk transportation in ancient Egypt—as well as the movement of other large stone sculptures and blocks—remain somewhat of a mystery, the archaeological record presents us with some clues. After an obelisk was carved at the quarry site, workmen used ropes to roll it onto a sledge and pull it to the Nile River, where a ship awaited. 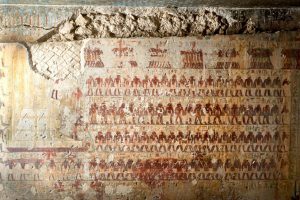 A glimpse at what this may have looked like comes from a painted scene in the tomb of a man named Djehutihotep, in which a colossal seated statue is tied to a sledge pulled by a large crew of men. One workman, who stands at the statue’s feet, pours water in front of the sledge’s path to make it glide more easily over the sand. 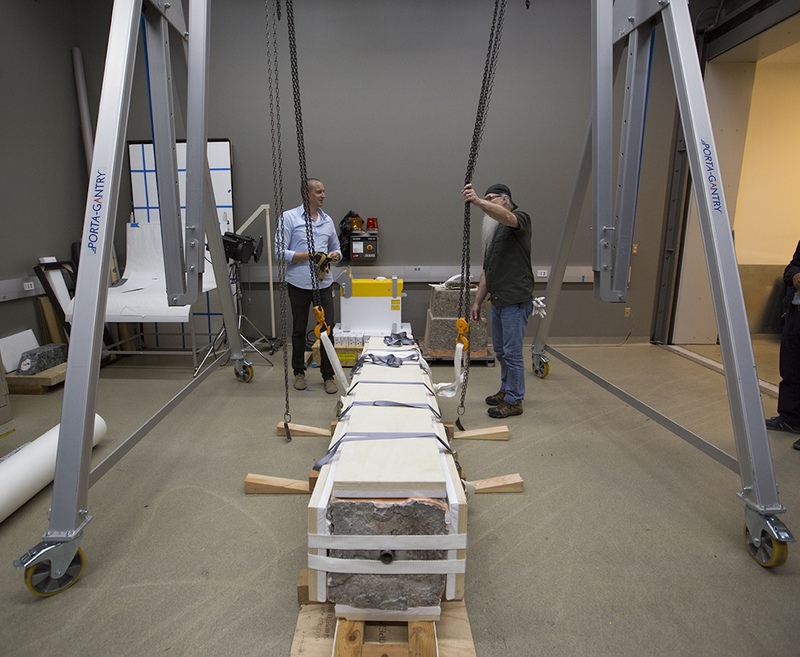 When the ship arrived at its destination, the obelisk was again placed on the sledge and moved to its final home. 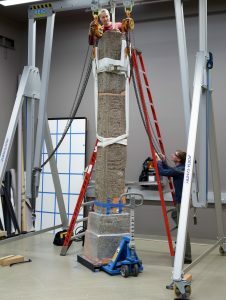 Raising the obelisk upright and situating it in place probably involved the use of ramps and ropes, but we do not know the exact techniques employed. 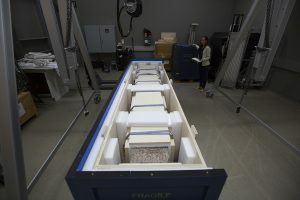 It certainly required a tremendous amount of labor and would have been a dangerous operation, as we learn from an inscribed stela dating to the reign of Ramesses IV (1153–1147 BC). 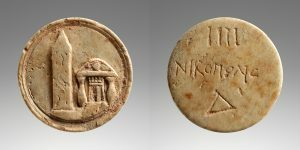 The inscription describes a stone-quarrying expedition to the Wadi Hammamat in Egypt’s Eastern Desert to procure large stone blocks for the pharaoh’s building projects. 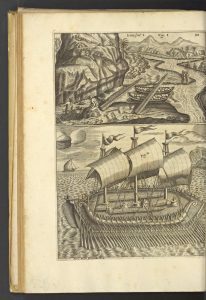 Over 9,000 men took part in the expedition (mostly soldiers, temple personnel, and stonecutters), 900 of whom perished during the trip. Many obelisks taken to Rome still remain in the Eternal City, though others have traveled even farther from their Egyptian point of origin (think Cleopatra’s Needle in New York’s Central Park). 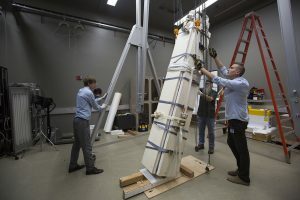 Often, obelisks have enjoyed a third life after having first been carved and erected in Egypt, then taken to Rome, and finally rediscovered and/or repurposed in modern times – the Vatican obelisk is one example. 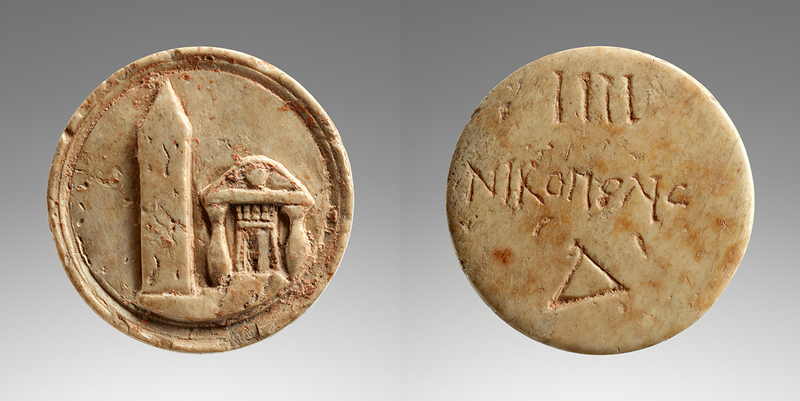 In my last post, I discussed this ivory token in the Getty’s antiquities collection, which may show the uninscribed obelisk that now stands in St. Peter’s Square at the Vatican. The emperor Caligula had this obelisk brought to Rome from Egypt in AD 37. Over a millennium and a half later, Pope Sixtus V ordered that the obelisk be relocated from its spot on the ancient Circus of Nero to the square in front of the basilica. In 1585 a special committee sent out a call for proposals, and hundreds of engineers flocked to Rome to submit their ideas. 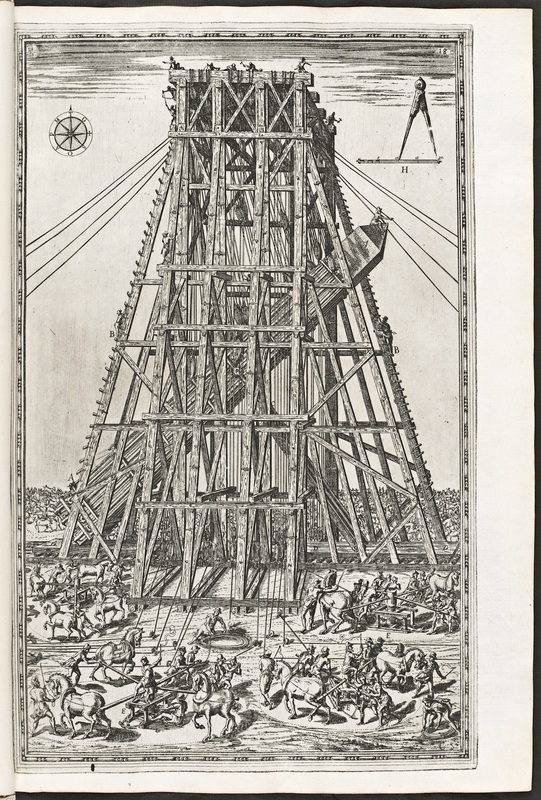 In the end, architect Domenico Fontana won out over his many competitors; he designed a wooden tower that would be constructed around the obelisk, connected to a system of ropes and pulleys. 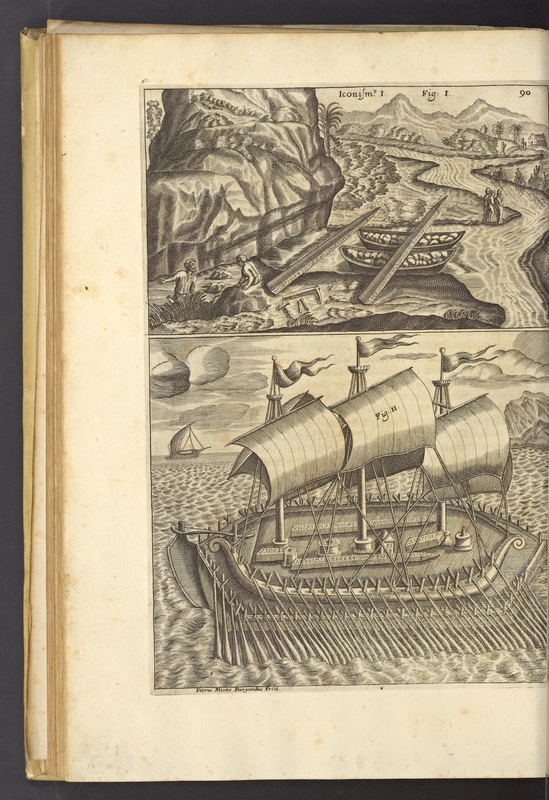 Engraver Natale Bonifacio documented this feat of engineering in a series of fascinating images, some of which are now in the Getty Research Institute’s special collections. A man-made embankment in the square made it easier to glide the obelisk gradually into position before standing it upright on the spot where it still stands today. The success of the operation inspired the excavation and re-erection of a number of other ancient obelisks in Rome, using the techniques Fontana had developed. 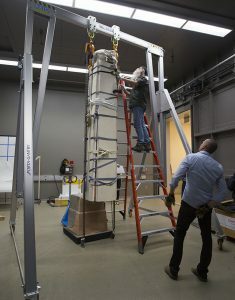 Thanks to twenty-first-century technology, moving the Museo del Sannio obelisk didn’t require any sledges or horses. Still, a team of experts and a great deal of time and manpower were needed to bring it to Los Angeles. This news article from Benevento shows a team of art handlers de-installing the obelisk in the Museo del Sannio galleries (scroll to the bottom of the article for more photos). Custom crates were built to safely pack the obelisk and its base, which together weigh about 5,400 pounds, before their flight to Los Angeles and journey to the Getty Villa’s conservation studios. At the Getty, the obelisk, which was shipped in a horizontal position, needed to be removed from its crate and erected. 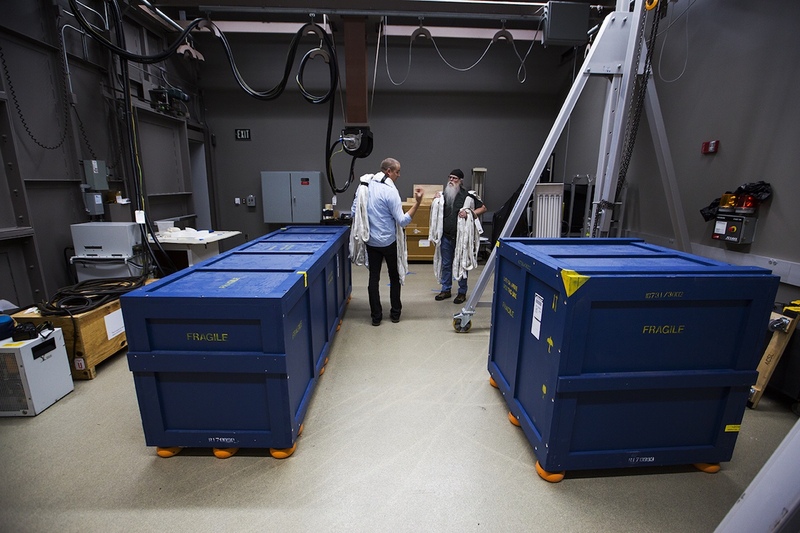 First, conservator Erik Risser and preparator Kevin Marshall got ready to unpack the obelisk (left) and its base (right). 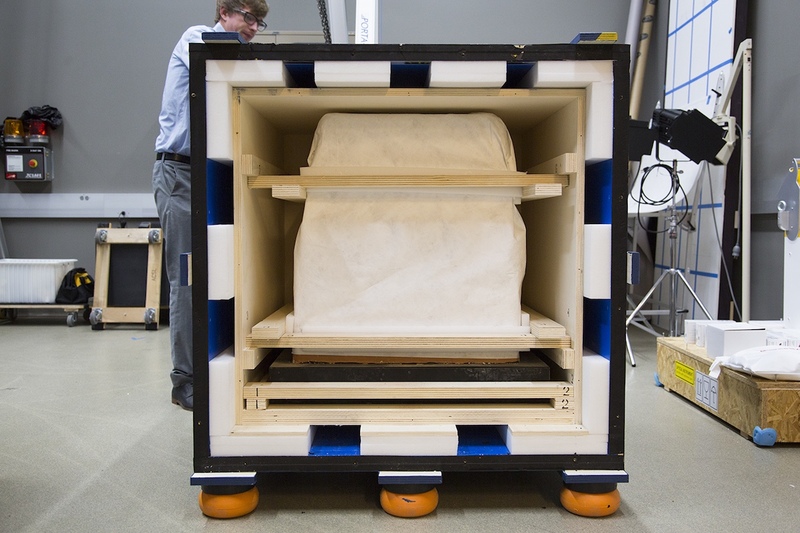 Removing the side and top panels of each crate revealed the two portions of the monument. 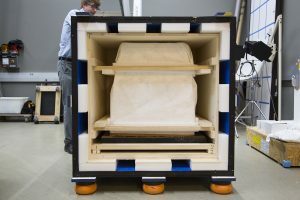 Both were packed in foam held in place by wooden boards. 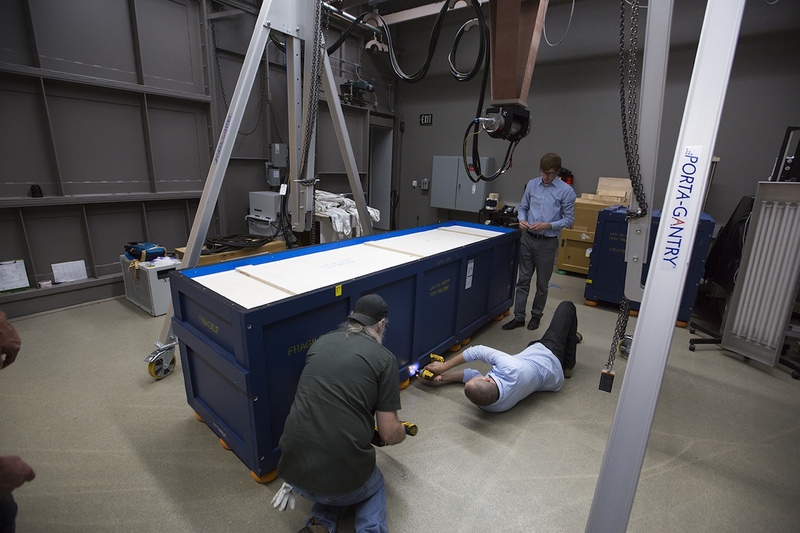 Erik, Kevin, and conservator William Shelley used a gantry to lift the obelisk out of its crate. 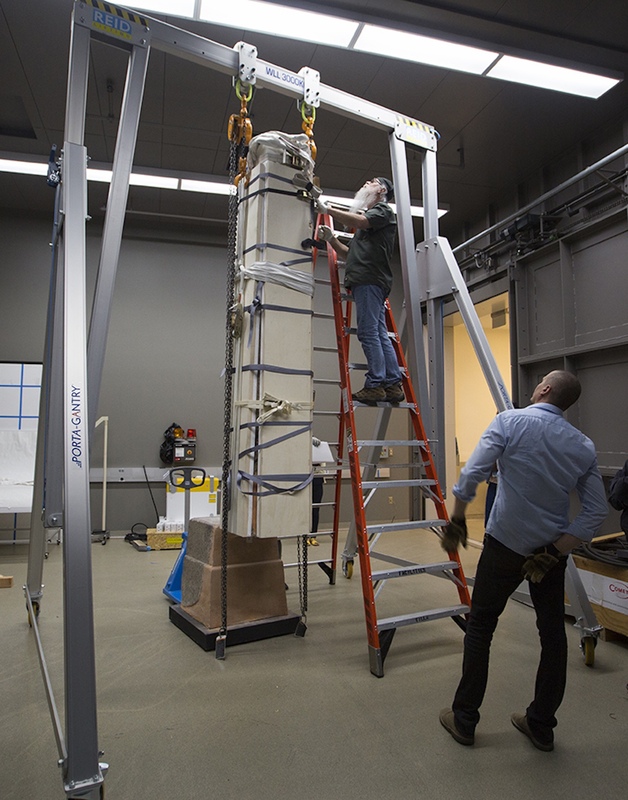 Erik and Kevin centered the obelisk beneath the gantry, then used straps and chains to gently hoist the 3,800-pound stone upright. The team left the obelisk in its foam and wood packing material for protection and greater stabilization during this part of the process. 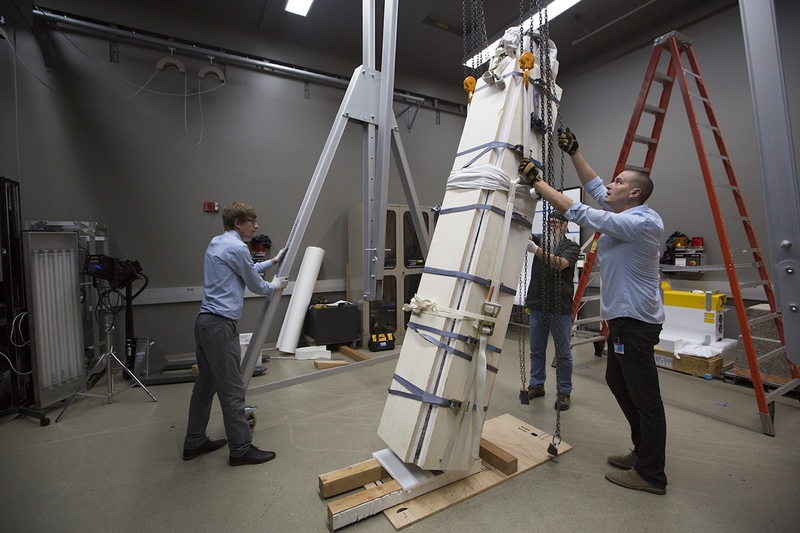 Once the obelisk was raised, Erik and Kevin lifted it vertically so that William could position its base beneath it using a pallet jack. All of that hard work was only the beginning. 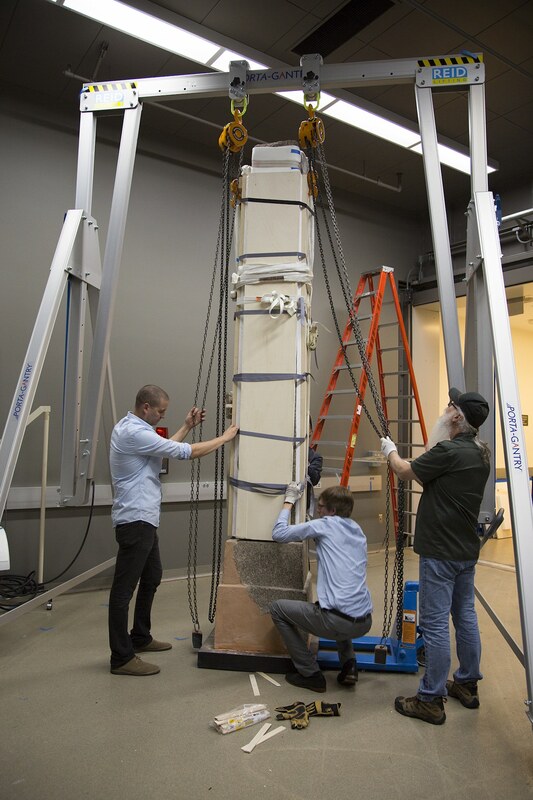 With the obelisk safely secured to the gantry, Erik and William could remove the packing material and undertake a careful examination in order to devise a treatment plan. 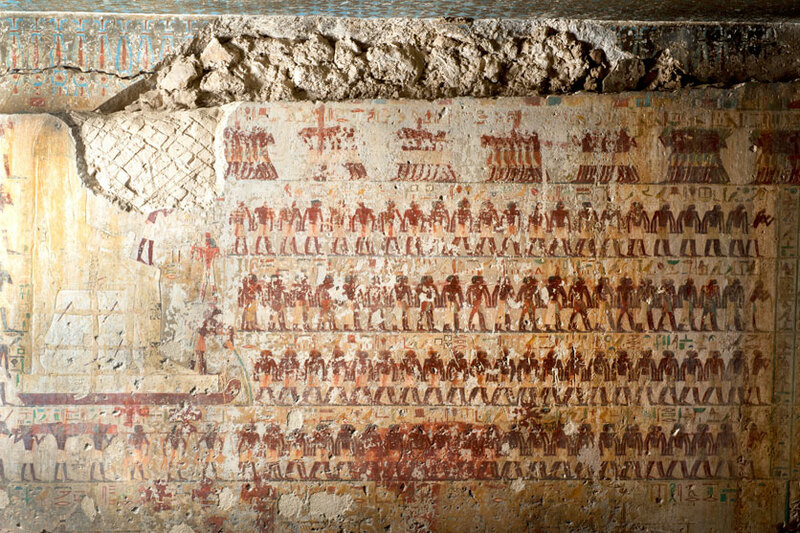 This entry was posted in Architecture, Art History, Egypt, History, Roman, Rome. Bookmark the permalink.